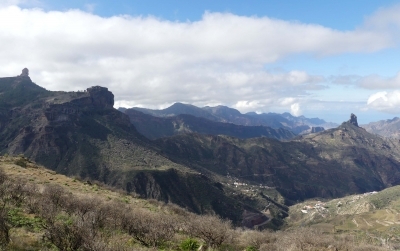 Risco Caido and the sacred mountains of Gran Canaria Cultural Landscape is part of the Tentative list of Spain in order to qualify for inclusion in the World Heritage List. The Canaries (population c2.2 million) already have 3 WHS. A “colonial town” (the rather “average” San Cristobal de Laguna), “Volcanism” (Teide NP) and “relict Macronesian vegetation” (Garajonay NP). So - what could be left for other islands – a “near duplicate” of one of the former subjects? Luckily there is an, as yet unrepresented, possibility - the archaeological sites of the pre-Hispanic inhabitants of the Canaries, known as the “Guanche”! They are considered originally to have reached the Canaries from N Africa some time after 1000 BC (possibly no earlier than 500BC) and to have been of Amazigh (Berber) origin. By the time of CE they had, on each island, developed a range of different but similar cultures and appear to have remained reasonably isolated from their continental neighbours until they were invaded in 1402 by a Norman adventurer working for Castille - Jean de Béthencourt. Although they only had primitive weapons, some of the islanders put up strong resistance, and their final defeat took until 1496. Subsequently they were “ethnically and culturally absorbed by Spanish settlers” (Wiki). Genetic studies have shown significant Guanche DNA content among current Canarians, which no doubt contributes to their pride in their pre-Hispanic history. Note the reference to “Archaeo-astronomy”. This is becoming something of a Spanish “speciality” (see my review of Antequera!) but, in this case, Spain has also tapped in to the “Dark-sky movement” with GC already majoring on its merits as a tourist destination in this respect. It thus claims that the sky is as much a part of the “landscape” as the ground and the sea such that its “natural” clear state should be preserved and then neatly links this to the nominated CL on the basis that the Guanche used the stars in positioning their structures and in their rituals! GC isn’t very large and one might think that it would be possible to visit all/most of the 4 locations reasonably quickly. Roads, however, are very twisty and slow (but well engineered) and it takes both a fair time to reach the area and to travel around/walk to the precise sites. Our GPS consistently under-estimated driving times - e.g the 43kms from Sta Cruz to the village of Tejeda at the “centre” of the Caldera (not included in the nomination) took 75 minutes to drive! We only had 7 hours in all and eventually only fitted in 1 of the 4 complexes plus a couple of other sites. To a greater or lesser extent, all of them contain similar “typical” remains of man-made troglodyte caves, ritual sites, burial chambers, granaries, and carvings/paintings. The excavated remains of pottery, carved figures, “mummies” and tools etc will need to be seen in musea or visitor centres (The “Mummies” in the Tenerife museum are regarded as “World significant” by aficionados of such matters - so that also extended our “Mummies of the World” tick list!!). Risco Caido – Barranco Hondo. This contains perhaps the most famous of the archaeo-astronomical sites - the “Sanctuary” is a cave (photos) with a man-made oculus through which sunlight shines at specific times. This is now only available to visit with prior booking for limited spaces. The Nomination file states “An application must be filed on line to gain access……Only 36 visits were organised in 2016, with 432 visitors as part of a site conservation plan”. Here is a link which explains and initiates the process. It only operates on certain dates from May - Sept, 10 persons max but is FREE - read "Condiciones de la Visita" for full requirements, waiting list procedures, prior registration, documentation required etc etc! A visitor centre has been/is being built nearby in Artenara, apparently with a replica “sanctuary”, but wasn’t yet open in Jan 2019. Acusa. An area of several groups of “Cave houses” (“home to one of the largest and most spectacular troglodyte enclaves” Nom File page 95 etc) around this point 28.007353, -15.679077 . Some caves are still in use (e.g as agro-tourist B+Bs) and I don’t know to what extent the more interesting are freely open. We don’t feel that we “bottomed” this nominated WHS. It will surely gain inscription at some time and, even if it doesn’t, maybe we will return to GC when we get “really” old and do so!! In particular, we missed all of the more famous named caves. Ok, that at Risco Caido is closed, but the replica sounds worth seeing, and missing the “Cuevas del Rey” was a blow - but flights won’t wait!! If we went again I would stay in one of the Caldera villages (or even a troglodyte house!) for a couple of days. Tejeda has been badged as one of “los pueblos más bonitos de España” ….. and then there’s still the rest of the island!